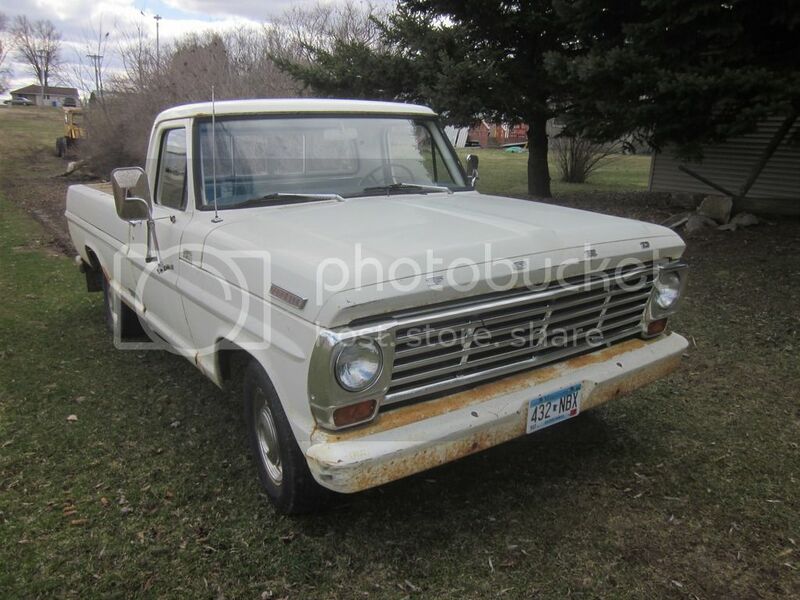 Hi Guys, due to some unexpected medical bills I'm forced to put my F100 up for sale. I've done most of the dirty work to it. I will tell you the good and the bad; I will hide nothing. -intake manifold sandblasted and painted. -brakes were done by previous owner not long before I bought it last year. -alternator was checked, works fine. -good battery with new cables. -exhaust is solid all the way back. This truck runs excellent, always starts right up. Manual choke. Heater works excellent. Horn works. Blinkers, lights etc. all work except for the brake lights (the switch is bad; they come on but as you push the brake pedal further down they go out). Shifts fine, clutch is good. Plenty of power. Engine does not smoke. Original seat and floor mat. Dash has usual Ford crack in the center. Has nice hubcaps and rings. Sliding rear window is not original, and I don't think the mirrors are either. Small crack in windshield, lower drivers's side. Not in line of view. Fuel guage does not work. Original AM radio works but isn't hooked up. Tires have good tread but are weather checked. Left rear went flat on me a couple weeks ago. Had to put a tube in it. Usual Ford rust, lower front fenders, some on cab mounts and hood hinges but not bad at all. Some rust on frame. Box is SOLID, its very very nice. It will hold water. One dent in grill, and one dent in the tailgate. THE BAD: rear main is leaking. At low speeds around town it hardly drips (which is what I mainly use it for: hauling out compost, grass, branches, etc. to the city compost). At highway speeds it leaks a lot more. If I were to keep it this would be the final thing I would fix when I got time. But I'm selling it as-is with the leaking rear main. Manual steering and brakes. Its just a good all around truck. It makes me sad to have to put it up for sale, but I'm hoping a fellow enthusiast will buy it and try to preserve it, but still use it. It was built at the Minneapolis plant in Jan. '67. Has the original Wimbledon white paint. 4.10 gears. The truck purrs like a kitten, and I think it will run trouble-free for a long long time. With the rear main fixed and some brand new tires I wouldn't hestitate to drive it across the country, I'm that confident about how it runs. Asking $2750 OBO. Call John 507-429-1634 Leave a msg if I don't answer. Truck is located in Altura, MN 35 miles east of Rochester; southeastern part of the state. Clear MN title in my name. The truck is sold fellas. It went to a good home and fellow Ford-man.